Windows 10 Professional 64-bit OEM. With Windows 10 Pro, you&###x2019;ve got a great business partner. Windows 10 Pro offers all the great features of Windows 10 Home, plus important business functionality for encryption, remote log-in, creating virtual machines, and more. You're already an expert. Windows 10 is so familiar and easy to use, you'll feel like an expert. The Start menu is back in an expanded form, plus we'll bring over your pinned apps and favorites so they're ready and waiting for you. It starts up and resumes fast, has more built-in security to help keep you safe, and is designed to work with software and hardware you already have. This combines the strengths of Windows 8 with Windows 7. Millions of people are already using Windows 10. The Windows Insider Program is a global community of fans who love Windows and want to help make it better. Insiders see the operating system in its earliest stages, and play a role in shaping it. Their feedback has contributed to the best Windows ever. Multi-doing helps you get to "done" faster. Easily snap up to four apps in place and see all open tasks in a single view. You can even create virtual desktops when you need more space or want to group things by project. This Windows will definitely blow the other Windows versions out of the water. Meet Cortana, your truly personal digital assistant. Works across your day and your devices to help you get things done. By learning more over time, Cortana becomes more personal and useful to you. Cortana's also best at reminders, delivering them at the right time and place so you forget less and can do more. Using Cortana with reminders is AMAZING! Cortana available in select global markets at launch; experience may vary by region and device. Please remove COA Concealment with care as the License Key underneath can be damaged easily. How to find your Microsoft product key. To find your 25-character key, you need to remove the silver scratch-off panel on the Certificate of Authenticity which is supplied with your product. This is easily done with a coin or fingernail. Don&###x2019;t press too hard or you could damage the key making it unreadable. Remember, to avoid damaging your product key. Don&###x2019;t use any other tool apart from a coin. You can also use your fingernail. Don&###x2019;t apply too much pressure. Don&###x2019;t try to peel the scratch layer off. Product Features: Familiar and easy to use. The familiar Start menu is back and better than ever, to give you quick access to your most important things. And Windows works with more hardware and software, including what you already have. Windows 10 starts fast, resumes fast and runs apps so smoothly even older machines feel young again. And the new Battery Saver feature helps you work and play longer than before. Windows 10 has more security features than ever and, with automatic updates, it helps you stay current on the latest and greatest features and security. Windows 10 is designed to be compatible with programs that run on Windows 7 or Windows 8/8.1. And your docs and files are preserved so you don&###x2019;t need to worry about things getting lost. Cortana is your truly personal digital assistant who works across all your Windows 10 devices to help you get things done. With Windows Hello, your device greets you by name and lets you log in with just a look or a touch &###x2013; it&###x2019;s faster and more secure and there&###x2019;s no need to type in a password. You can even write or type on webpages and easily share the markups with others. Get great new ways to stay organized and be productive. You can easily snap up to four apps on one screen and create virtual desktops when you need more space. Windows 10 is the perfect partner for running the world&###x2019;s greatest productivity suite including Word, Excel, PowerPoint and Outlook. Right for business Join your Domain. You can connect to your business or school Domain or Azure Active Directory to use network files, servers, printers, and more. Get additional security with BitLocker to help protect your data with encryption and security management. Windows 10 enables you to log in with Remote Desktop to sign in and use your Pro PC while at home or on the road. Create and run virtual machines with Hyper-V so you can run more than one operating system at the same time on the same PC. OEM software may ONLY be distributed with a fully assembled computer system. For a desktop operating system or application software, the software also must be preinstalled on the hard drive of the fully assembled computer system, using the OEM Preinstallation Kit (OPK). The system builder who installs the software is responsible for the provision of end-user support. Founded in 1999, the company started off as the brainchild of a group of IT developers and PC retail experts, who wanted computer components to be more readily available and at lower prices. Ebuyer grew quickly from its humble beginnings to become the site for overclockers and PC enthusiasts. At Ebuyer, our business philosophy is simple: give customers and businesses what they want, when they want it. We never stop improving our world class operation by putting our customers - and their needs - first. Payments shall be made by you without any deduction whatsoever unless you have a valid court order requiring an amount equal to such deduction to be paid by the Supplier to you. The goods you order will be delivered to the address you give when you place your order. On exercising your right to cancel you shall be required to return the goods to the Supplier. Should you fail to return the goods, the Supplier reserves the right to deduct any direct costs incurred by the Supplier in retrieving the goods as a result of such failure. Every effort will be made to deliver the goods as soon as possible after your order has been accepted. In this case, the Supplier will inform you of any delay as soon as possible and will give you the option of cancelling your order at this point. Upon receipt of your order you will be asked to sign for the goods received in good condition. However, there may be occasions when you will need to return items to us. Items Faulty on Arrival If your items are faulty on arrival, you have 28 calendar days in which to inform us of the fault (please note that for our business customers, this is 14 calendar days). In some cases, manufacturers provide a specialist full on-site service and/or telephone help facilities for your convenience which we recommend you use in order to correct the fault quickly. Once you've informed us that you wish to return goods under the DSR, you have 28 calendar days to do so, at your own expense. You May Also Like These Items. This listing is currently undergoing maintenance, we apologise for any inconvenience caused. 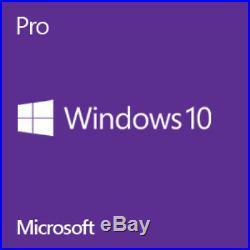 The item "Windows 10 Professional 64-bit OEM" is in sale since Saturday, November 4, 2017. This item is in the category "Computers/Tablets & Networking\Software\Operating Systems". 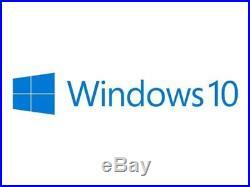 The seller is "ebuyer_uk_ltd" and is located in Howden, Yorkshire, United Kingdom. This item can be shipped to United Kingdom.